The true marque of the Rising Sun. Makers of the famous A6M Zero fighter plane of World War II, it bore the Rising Sun on its fuselage and wings. Mitsubishi was once the largest manufacturer in the world, producing, not only automobiles and aircraft, but electronics, plastics, steel, glass, paper and nuclear energy. Chances are, your JDM product has some Mitsubishi in it. Mitsubishi Motors, like most of their subsidiaries, thought big. Look at Diamond Vision, some of the largest video screens anywhere. But Mitsubishi wanted to not only make great cars, but win with them on the world stage. And to do this, they created the Evolution line of Lancers and ultimately replace the Galant VR-4 in the WRC. The Lancer was a small, four door econobox and by no means, fast. So the engineers at Mitsubishi turbo-charged the four cylinder 4G63 engine and massaged it to 276bhp (Gentlemen’s Agreement number) although actual numbers were much higher. Included in the upgrades were all wheel drive, active center differential, active yaw control, Recaro seats, Brembo brakes, Momo steering wheel, flared fenders and intercoolers. There was also three surface settings the driver could choose: tarmac, gravel and snow. These changesbwould allow anyone with a dream and some money to modify and race the Evo in all levels of rallying. As with most race-borne street cars, the Evolution was brought about by homologation rules. This example is the seventh in the series and the first that did not have to abide by the homologation rules due to regulation changes by the FIA that forced Mitsubishi to build race cars according to WRC rules instead of Group A rules which required street examples be made available to the public. 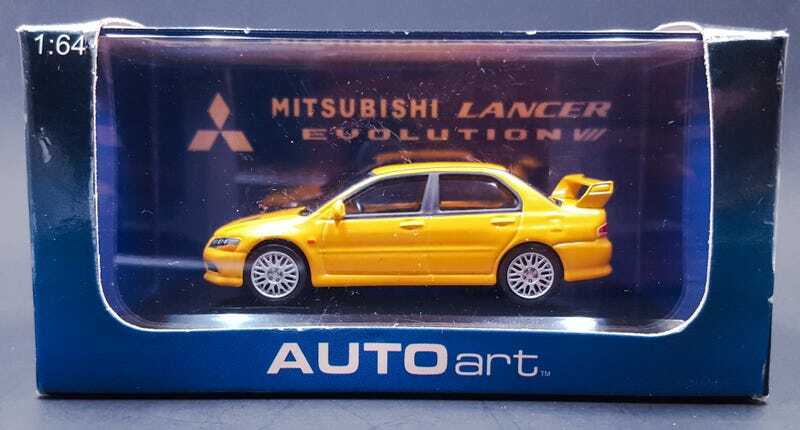 This AUTOart example is a 1/64 scale in Lightning Yellow and the details Aa puts into their larger scale models shines through here as well. Everything looks correct with the headlights and taillights well represented. The emblems too, are clean and legible and even includes a trunk lock tampo! The ride height is correct as are the wheels. The glass is ridiculously clear and allows you to peer into the well appointed interior. The details they’ve put into such a small car are amazing. Dials and dash layout are correct as are the Recaros. The series VIII car that followed was the first to be brought to the US following Subaru’s success with the WRX the previous year. Mitsubishi and Subaru have long been rivals in the WRC and the rivaly continues on the street.